In the break away sector of Kite Surfing, there is one kite which hides its technology behind its simplicity. The Drifter's minimal 3 strut design both hides and illuminates its brilliance. The three well placed struts keep the profile of the kite intact through constant angle of attack changes while reducing the weight. 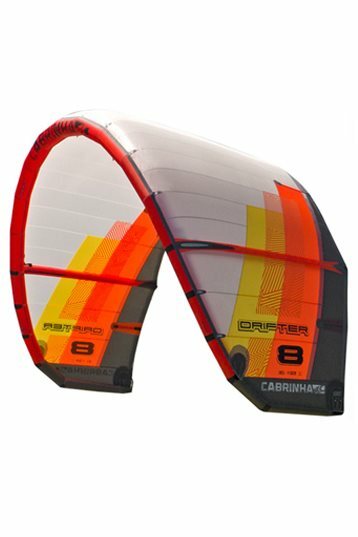 This light weight but durable kite is dedicated to surf, yet it shines as a freestyle kite for wakeskating, skimboarding or flat water freestyle. While surfing hooked or unhooked the Drifter makes the most of its excellent slack line drift ability. Slack line drift is the kite's ability to stay aloft even when the lines are temporarily slackened by depowering. But the Drifter's main beauty lies in its simplicity. We've pushed the complicated technology into the background so that all you have to think about is how you're going to tear apart the next wave. 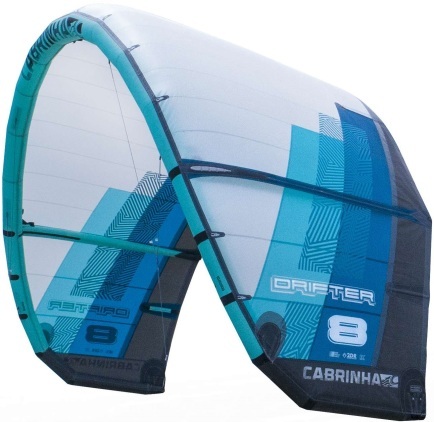 Tried a old Cabrinha drifter from 2012 in gusty offshore wind and head high shorebreak. The Drifter felt stable and trustfull in gusty winds. The power on the bar is easy to handle. Short and total depower. The drifter turns arround its tips. Used to a center turning kite so that feels different. After a big crash my kite was tangled but to my surprise, easy to restart. Because It was a old kite i was affraid It would rip apart. But no damage! Liked this special wave kite, felt comfortable in a few minutes. Got all the characteristics a wave specialist is looking for. WOW is all I have to say about this kite. I finally was able to get on the Drifter in some waves. Note: I am a 250 rider, so an 11m kite that is designed for wave riding is my small kite. This particular session the wind was up in the low 30-35 mph with waves from 3-4 ft on the shore break, to about 8 ft out by the second sand bar. The wind was pretty consistent without too many big lulls or gusts. In my opinion, the perfect day to test a new kite. I was able to ride the 2012 Drifter fully powered and hold it down, or pull in the trim strap about halfway and was able to have more control over when the power actually kicked in. 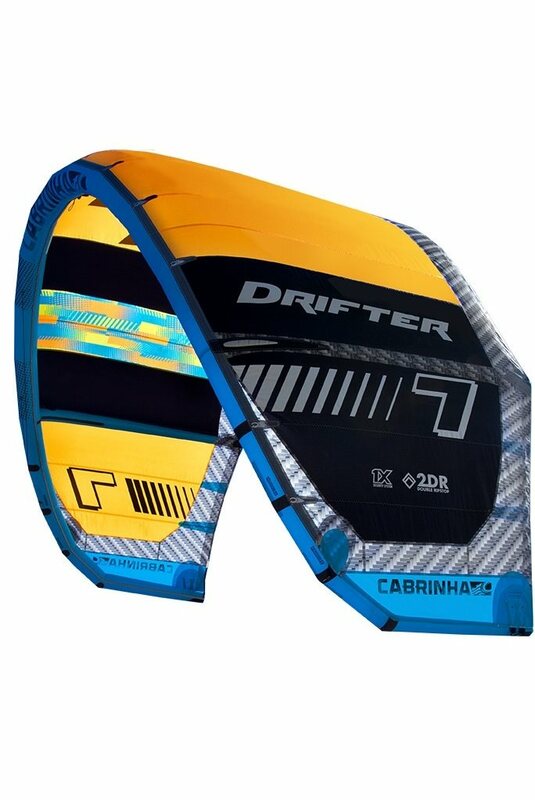 The first thing I noticed about the Drifter was that it turned way faster than its brother, the Cabrinha Switchblade, or my 2nd favorite kite to ride, the North Rebel. 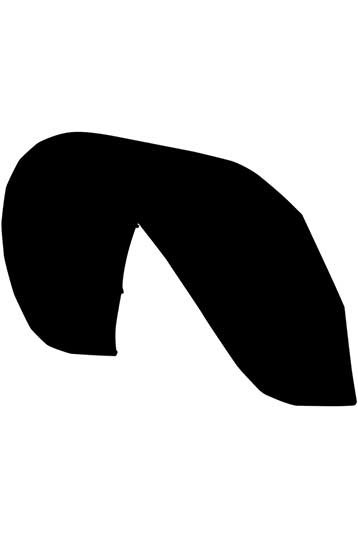 The increase in the Drifter's turning ability is the 3-strut Delta shape and the pivotal turning. Pivotal turning is when the kite turns closer to the center of the kite and actually dumps power during the turn. This type of riding is key for wave riding for sure, but not so friendly for big riders in lighter winds. Since it was blowing so hard, the loss of power in the turns was actually really nice. I didn't have to worry so much about losing an edge or veering downwind to complete a transition. The 2012 Drifter reminded me a lot of the 2012 Liquid Force Envy. It is also important to note that the two kites are similar in size vs. power. The 2012 12m Liquid Force Envy had noticeably more power than the 11m Cabrinha Drifter when I flew them back to back a few days prior to this last session. I also noticed that the Envy and the Drifter both had similar static bar pressure: not much at all. However, the input pressure to steer the kite is a little harder on the Drifter vs. the 2012 Envy. Personally, I like that sort of a feel; it makes the kite a little more controllable and less twitchy. Now on to the drifting part. WOW; since I am so used to the feel of the Switchblades, this whole pivotal turning and drifting was a new concept to me. Now I can say I am in love. 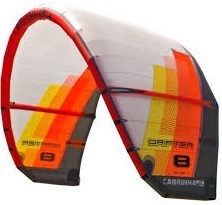 With the added Cabrinha stability and nice constant feel in the gusts, this kite made for a fun day on the water. 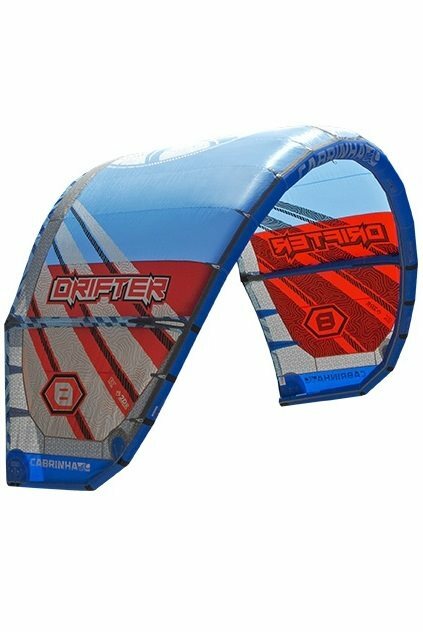 And yes, Drifter is the right name for the kite. On several instances I was headed down the wave directly at the kite with a lot of speed and it just hung out in the sky and didn't get all freaky. On the Switchblade, Crossbow, or the North Rebel, you would have caught up to the kite and been in a bit of trouble. One downside for me on the kite was that light bar pressure. I am used to being able to feel the kite in the sky a little better, but this session I found myself spotting the kite after turns and after landing jumps. New kite jitters maybe. I'm sure it is just a "time on gear" sort of a thing, and after a few more sessions it will be less of an issue. The Drifter won't be for everyone since the biggest size it is available in is an 11m. 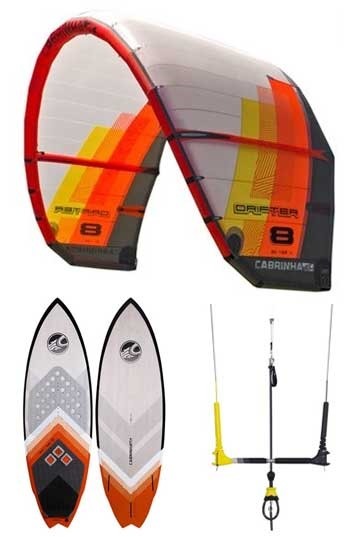 For heavier riders like myself the Drifter line will make for a fun high wind kite, and for the surfers out there the Drifter will be a killer kite for the waves. For the free riders and cruisers out there you will notice the kite does not "like" to go upwind as easily as other kites, but that should be expected. 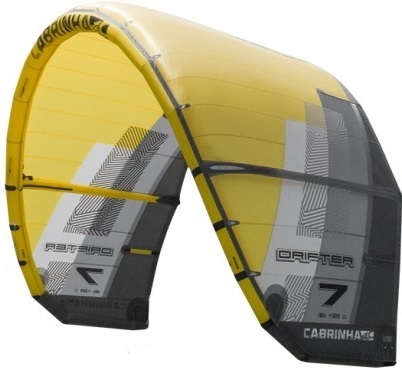 The Drifter is not an all-around kite; it was built for the waves and it does that well.